Size: 4.7" x 8.2" x 1.2"
Nothing else than an upgraded TI-92. Please refer to the Expansion Port of the calculator. Beyond the additional 128k Memory you get the choice of 5 user languages (English, French, German, Italian and Spanish). We assume that the TI-92 II is identical to the TI-92 but integrates the TI-92 E module available in Europe. The next upgrade was done either with the TI-92 PLUS Module containing 384k Byte Flash ROM or the TI-92 Plus calculator itself. 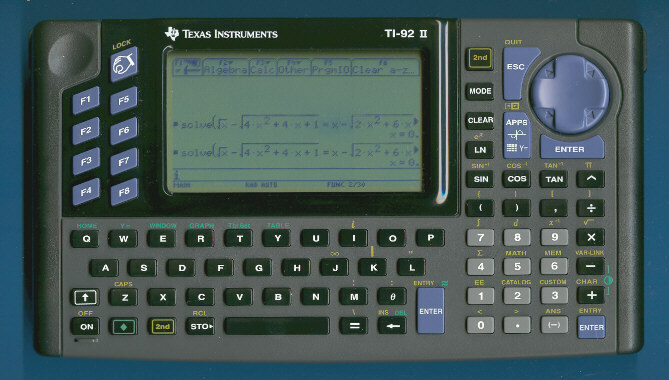 Since the TI-92 Series and Voyage 200 feature a QWERTY keyboard they are not allowed on ACT, SAT, PSAT and AP exams.